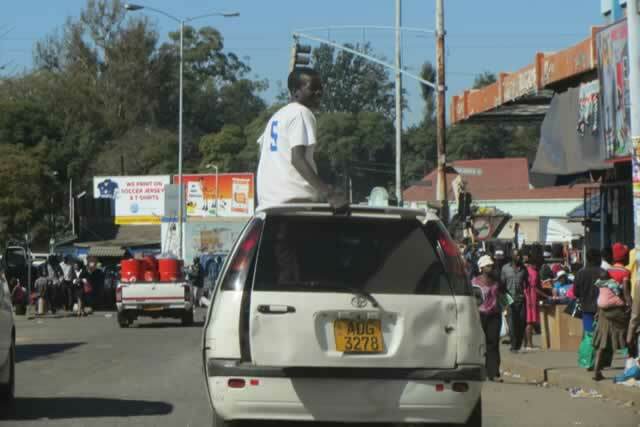 When the City of Harare introduced a shuttle service meant to do rounds in the central busines district (CBD), many commuters thought efficiency and order would finally return to the capital’s streets. The introduction of the shuttle service last year meant the notorious pirate taxis, also known by their slang name, mshika-shika”, would finally been defeated, so many people thought. Commuters would now board the affordable city shuttle service at a cost of R3 compared to the mshika shika ride which costs R5 per trip. It was an exciting launch with the City of Harare parading their new found solution to Harare’s disorderly streets. Operated by a group of minibus owners identified by council, the shuttle service should pick and drop passengers along Fifth Street at Simon Muzenda, former Fourth Street, bus rank, corner Fourth and Jason Moyo, Food World (between Angwa and Orr Street), Chinhoyi and Speke Avenue, Bute and Abercorn Street and at TM Supermarket along Kenneth Kaunda Street. But just a few months down the line, the mshika shika scourge that was supposed to have ended is growing bigger. The numbers increase every day. But there is hope, the city has woken up from its slumber and as they move to restore order by dealing with illegal street vendors, it is imperative that they find a lasting solution to pirate taxis. Commuters who have used both mshika shika and the shuttle service speak of their experiences with both. They say the service which is supposed to restore order and make it easier to connect the different points of the city and its environs is not working to their expectations. Ms Salome Tirivanhu says the shuttle kombis are always full whenever she tries to hitch a ride. The problem, she says, is that they rank at either Copacabana and Fourth Street waiting to fill up. “It takes about five to 10 minutes for a shuttle kombi to fill up in the afternoon. “When the smaller cars come, they take advantage of this gap and load passengers who are in a hurry. This has made the mshika shika more popular with passengers,” she said. Another commuter, Mrs Loice Mauto of Mufakose, said the problem of pirate taxis was testimony that the city fathers had failed to provide a reliable, cheap and safe transport system to connect various parts of the CBD. “Harare needs a proper urban transport system based on buses and, in time, incorporating rail and metro links as the city continues to expand and the population grows. Imagine I have to drop at Copacabana and walk all the way to the corner of Sixth Avenue and Nelson Mandela where I work. “I can’t use the pirate taxis because they are expensive. After paying $1 to get into town there is no way I can pay an additional R5 to get to my workplace,” she said. “It is the role of the city to provide affordable means of transport to connect points in the city centre. We need a bus system that is continuously on the run and operates on a timetable not on the number of passengers. The pirate taxis are not orderly and it is risky to use them in the Harare traffic jungle,” she said. Todd Maringapasi of Mabvuku feels pirate taxis are a nuisance that needs to be dealt with. “We know there are plans to remove vendors on the streets of Harare but that clean-up operation must also include the notorious pirate taxis. Yes, they are giving a service but the manner in which the cars are driven in the city centre endangers both the pedestrian and the travelling public,” he said. He also raised concerns over the way the city shuttle service operates. “The shuttle service is now only transporting commuters from point A to B and is not picking and dropping people along the way. Commuter crews engaged to provide shuttle service wait for the buses to fill up before leaving Fourth Street. What happens to someone requiring the shuttle service and is at Pick n Pay in the city centre? “Should that person walk to Fourth Street yet there is a designated drop off and pick up point at Pick n Pay and at Food World along Jason Moyo, for example?” he pointed out. He said the solution was to introduce conventional buses, especially those with two automatic doors and select designated bus stops where commuters are assured of a bus every 10 minutes. “Shuttle users can then buy swipe cards or tickets that allow them access into shuttle buses for a certain period,” he added. Harare requires a holistic approach in correcting the transportation problems. A properly developed shuttle service can easily address the problem of congestion and vending as commuter buses and kombis will be forced to drop commuters outside the city centre. The passengers can easily get into shuttles and be taken to their various workplaces. Aldington Chari of Norton said city parking should be made more expensive to deter private motorists too much time in the city centre, thus creating unnecessary congestion. Once commuters are dropped and picked up at designated points, he added, vendors would be forced to operate at these places, not every street corner in the CBD. “Measures like these can work wonders in decongesting the city. “Create parking lots outside the city and introduce the shuttle service. A R20 fee or a multi ride ticket will encourage commuters to use the shuttle service and help decongest the city streets. A decongested street won’t be attractive for vendors who will follow the market to designated commuter ranks,” said Chari. Another commuter , Rosemary Mari, said kombis were not ideal for a shuttle service as they were not only costly but also difficult to manoeuvre. “Imagine I am seated at the back seat and want to drop off at Joina City. This means some of the passengers have to disembark to allow me to drop off and that is time consuming. The shuttle service will only be successful if larger buses with more than one exit point and passage where passengers can walk to the door and exit when the bus stops are introduced. “Drop and pick up points must be clearly marked in the city and the route of the shuttle publicised,” she said. With current traffic jams also caused by dysfunctional traffic lights, pirate taxis and vendor-congested streets during peak hours, Harare will never achieve its ambition of becoming a World Class City by 2025 if nothing is done, quickly too. These are an “effective urban planning and management, decentralisation policies and appropriate institutions, a system that creates equal opportunities for all, participation of civil society, elected local officials, a favourable business environment, access to basic amenities and public transport and mobility”. The city still has a long way to go if what is on the ground is anything to go by. Harare City Council spokesperson Mr Michael Chideme said shuttle buses were not supposed to be parked but to be on the move every time. “Unfortunately, the service is being affected by pirate taxis, making costly for the kombis to leave pickup points empty. “Pirate taxis carry only five people and are therefore seen as a quicker mode of transport connecting different spots in the city. Vendors have also made it difficult to operate the shuttle service as they are selling their wares on the streets. The shuttle buses cannot pick or drop passengers at certain points without obstructing other traffic,” he said. Mr Chideme said plans were, however, underway to introduce mass transport to ferry commuters from the suburbs and back for 50 cents. He said trial-runs had already been done and what was left was implementation. “Our plans are to introduce a mass bus transport system following the successful trial-runs of the same between January and April 2015. “The mass transport system will be using buses that carry up to106 passengers at a low cost. “In the CBD, we will maintain the shuttle service that is however being affected by pirate taxis,” he added. Town planners say the revival of mass public transport is the only way to restore sanity in Harare’s streets and that as long as illegal kombi and taxi operators prove to be a source of revenue, the chaos in the CDB is here to stay.